At the age of twelve, every child in Ember is assigned a job. Curious, bright-spirited Lina Mayfleet longs to be a messenger, but is instead assigned to dreary, dirty work in the underground Pipeworks. 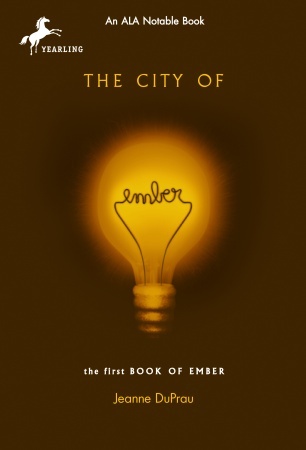 Doon Harrow, her classmate, is convinced that the sporadic blackouts of the great lamps of Ember – the only lights in a world of immeasurable darkness – forebode worse troubles for the city. He longs to investigate the enormous generator in the Pipeworks that provides the city with all of its power, so when he receives the job of messenger, he and Lina eagerly swap their assignments. As the blackouts increase in frequency and fear spreads among Ember’s citizens, Lina soon comes to share Doon’s suspicions that Ember is a dying city. Together the two embark on a search to uncover Ember’s origins, and to find a way to lead their people to the bright city that Lina is sure exists somewhere in the Unknown Regions beyond Ember. Unfortunately, the plot was sufficiently predictable for me to lose interest in following it about halfway through, and the narration often tends towards the thuddingly declarative, particularly during the action sequences. Granted, I’m sure the plot wouldn’t have been predictable had I been, say, 9, which is of course the primary intended audience. Still, I was tempted to give up on it several times, only for my interest to be renewed by the particularly lovely and joyous descriptions towards the end of the novel. Lina and Doon are likable enough as protagonists, and their extreme naïveté, though frustrating, at least makes sense given the society they live in. I did find Lina’s goody-goodiness wearing at times, however, and followed Doon’s sections of the narrative with more interest. There are a number of poorly conceived plot points made for the sake of convenience or symbolism or general narrative pretty, but I kind of slung them all in the “eh, slightly contrived and not entirely thought-out YA” bucket and tried to ignore it. Overall – points for concept, half-points for execution, and put this under the list of books I really, really wish I had read when I was younger. Spoilerish remark for those who’ve already read it, highlight to see: Shades of The Giver, much? So much similarity in narrative structure and plot points, but I guess the premises are so close to begin with that it’s inevitable. It didn’t particularly bother me, anyway; it’s clear that the overlap was unintentional. I agree…it’s one that I liked and finished but didn’t love. And I didn’t finish the series either. It felt too clunky and not entirely thought out. Yeah, I freely admit to Wikipedia-ing the plot of the sequels, because I wanted to know what happened, but didn’t care enough to actually read. I read the book and had a similar reaction, essentially I wished I’d read it 5 years earlier. The book felt a bit like a video game to me due to the clunky writing and formulaic plot. The movie is ….a few steps below mediocre. Then again my main reason for hating it so much is because I can see the seams in the viz effects*. Other than that, it’s a so-so tween action pop-corn flick. * I was also watching it with a viz effects major- they take ALL the fun out of watching pop-corn movies. I was also watching it with a viz effects major- they take ALL the fun out of watching pop-corn movies. I can only imagine. It’s like trying to shop for graphic novels with my illustrator friend! That’s too bad, though, I would have expected that the visuals at least would be fun.